Barcelona is much more than just Gaudi’s work. We enjoyed it’s beautiful weather, it’s beaches, it’s markets, and it’s Ciutat Vella (Old City). We spent most of Friday and Saturday in the old city and walking along the beach. While November wasn’t quite sunbathing weather, it was still nice enough to walk along the boardwalk in short sleeves, eat tapas outside at one of the restaurants, and sit on the bench enjoying the view of the Mediterranean Sea. Other than the beach, a Christopher Columbus statue that is pointing the wrong way and lots of boats, there isn’t too much to see or do along the waterfront, but it’s a great place to relax and enjoy the sublime weather. The medieval part of the city is between the waterfront and where our hotel was. We stayed in the new part of the city which is officially outside what use to be the ‘old city’s’ wall. The new part of the city is incredibly clean, beautiful and modern. It has every thing you could possibly need. At times I almost forgot we were still in Spain. It’s very westernized with lots of high end shops and restaurants and nearly everyone seems to know English (and French, and Catalan, and Spanish). The ‘old city’ however is unique – you know you’re somewhere special. It almost feels like you’ve been transported back in time. Most of the old city dates back to the middle ages and there are even some Roman ruins dating back 2,000 years. Like Toledo, there are lots of narrow, cobblestone streets which are for pedestrians only – making it fun to wander around. Most of it is very well preserved, clean and safe. Inside all these beautiful old buildings are museums and churches as well as lots of cute shops and restaurants hiding in there too. Among this maze of streets and alleyways we found the amazing Cathedral first, and then we saw three other old churches: Santa Maria del Mar (which use to be on the ocean and over time has become landlocked), Santa Maria de Pi (which was surrounded by art booths), and the cute little country church, Sant Pau de Campo. I really liked Sant Pau de Campo. It’s really tiny and it’s the oldest one in Barcelona at almost 1,000 years old. It use to be out in the sticks, now it’s in the middle of the city. When we were there, there were some musicians practicing inside and the acoustics were amazing. Barcelona’s old section also has it share of quaint plazas, hidden courtyards, parks, musicians, art, festivals and fresh food markets too. Despite spending the better part of two days down in that area, we didn’t come close to seeing everything. We’ll have to come back to Barcelona for sure. Just like Madrid, there is so much to see and do around there, it would take a long time to complete that list. While I’m working on our posts from Barcelona, I figured I should publish our post on the place we went the weekend before. Alcala de Henares is an interesting place for many reasons. First, is it’s university. Alcalá de Henares was the world’s first planned university city… the first city to be designed and built solely around a university. It has served as the model for many other university towns in Europe and the Americas (UNESCO World Heritage Website). All universities before this one existed because there was a city already there. That fact alone put it on my ‘must see’ list. I must admit though, neither one of us thought the university itself was that special. What we liked much better was the medieval part of the city that was next to it. The old, narrow, cobblestone streets, the buildings with lots of ironwork, and the huge covered sidewalks. It reminded me of New Orleans, but cleaner and nicer. There were so many churches, convents, and monasteries in that area that steeples and spires were sticking up all over….making for some beautiful photo opportunities. And on the tops of these classic old buildings were (what I enjoyed the most about this city) – the beautiful white storks. The city claims to have some 90 pairs of storks living there. Just about every time we looked up we could see them either in their nests or flying around. Some buildings would just have one nest, but most had more. There were 14 nests on an old building beside the Archbishops Palace. There are lots of other interesting things about this city. It was here at the Archbishops Palace where Christopher Columbus met with King Ferdinand for the first time and planned his excursion to the West. Catherine of Aragon was born in the Archbishops Palace as well (she ended up being the first wife of King Henry VII of England). And guess who else was born in this town? Cervantes, the great Spanish author of Don Quijote. The main plaza in the city’s center is named after him and you can visit the house he was born in. On the second floor of his house are old editions of his books (in many different languages). The oldest one we saw was 1605. There are also two child saints (Justus and Pastor ) buried in the cathedral. The city has Roman, Moorish, and Jewish history associated with it as well. We briefly stopped in the archeological museum which displayed various mosaics and artifacts from these and earlier settlements dating back more than 2,000 years. Everything we saw was very interesting and educational. In a way, I felt like I was in school all day. The last thing we decided to do before heading back home was have lunch. This city still preserves the old Spainish tradition of getting a free tapa when you order any drink. The inside of the restaurant we ate at was beautiful: brick archways, wooden beams on the ceiling, a copper bar, chandeliers, and old wooden tables (I really should have taken a picture). I ordered a glass of wine, and got some ham croquettas and french fries for free! Robert ordered coffee and got a plate of ham, eggs, and potatoes for free! We could have chosen from a number of different tapas – including hamburgers, calamari, salmon sandwiches, etc. Our total lunch bill ended up being only 5.50 euro (about $6.50) – not bad for Europe. Alcala was a much bigger city than the places we have been visiting. It is definitely interesting and the most lively and youthful place we’ve been so far – I’m so glad we went. However, other than the storks and free food, I’m not sure there is anything here that would keep bringing me back….unless I was 20 years younger. It’s a great college town but it’s definitely geared more toward singles and young couples. There seems to be a heated cyber debate as to which city is better, Toledo or Segovia. While I have not been to Segovia yet, I can say that Toledo should not be missed. It is an easy 30 minute non-stop train ride from Madrid to the base of the city’s historical center, and there is so much to see and do. It warrants at least two full days. We only went for a day trip this time but we will definitely be going back at some point to spend a night. Actually, what I consider to be one of the most beautiful things Toledo is it’s surroundings. The Tagus river (which is the longest river in Spain) nearly surrounds this hilltop city, creating a little canyon around it. In the past it played a strategic role in the city’s defense, today it just adds to it’s charm. The views from anywhere along the river are amazing and if you just want to take a stroll or do some fishing, there is a lovely walking/biking path around the base of the hill. While most people take the bus to the main plaza from the train station (which is beautiful btw), it’s just as easy to walk. In 10 short minutes, the walk brings you to one of the two beautiful old bridges that cross the Tagus: the Alcantara bridge. From here, there are wonderful views of the Alcazar, parts of the old wall, the medieval castle of San Servando, and of course the river. We went thru the keyhole shaped entrance at the other side of the bridge which lead up LOTS of steep steps until we reached the old part of the city very near the main plaza. After walking around the city all day, one thing becomes very apparent: it’s a steep, hilly city built with lots of rocks and bricks. I’m really glad I wore my walking shoes! Our goal this trip was to get to know the city and avoid other tourists as much as possible. I think we did a pretty good job considering it was a Saturday. We managed to visit two museums (El Greco and Santa Cruz), one mosque (Cristo de La Luz circa 999AD), the oldest synagogue in Europe (Santa Maria Blanca), one church (San Ramon), both historic bridges, the Puerta Bisagra and the Puerta del Sol. We literally walked all over the city. In the process we ate pastries, did some window shopping, had a deliciously long Spanish-style lunch (with a bottle of wine), bought some mazapan (Toledo’s traditional sweet), and took LOTS of pictures. We also saw lots of places we will try to visit next time we are there including the famous cathedral, the monastery, and the Alcazar (military museum). By the end of the day, I noticed something interesting about this town. Though it’s very compact, every section of the old city has it’s own personality. The west side was more open and park like, while the center was compact and dark (the narrow, curvy cobblestone streets and alleys challenged my navigational skills several times). The Jewish Quarter was very quiet and reserved, whereas the main plaza was loud with lots of activity. This will all be highly useful information when I go to book our hotel. Just think about it: There is more than two thousand years of history within the walls of Toledo, and the whole city is a UNESCO World Heritage site. All the civilizations that lived here (the Romans, Visigoths, Moors, Jews, and Christians) left a wealth of treasures for us to enjoy in the forms of architecture, art and culture. I can’t imagine someone not liking this city – as there is something for everyone. The only area that didn’t really appeal to me was around the main Plaza which was way too ‘touristy’ – too many shops, advertisements and even a McDonald’s. I know others like that sort of thing though. Click on the photos to see more pictures of Toledo. We arrived in Bangkok Friday evening, and settled into our apartment. It was so nice to have a home-like space for the three days we were in Bangkok. We loaded up the fridge with some essential snacks and drinks and felt immediately relaxed. Our apartment building was located on a quiet street walking distance from some great restaurants yet conveniently located to all the major tourist sights. It was a very nice place and we would definitely stay here again if we ever found ourselves in Bangkok. On Saturday we did a bike tour of the Siam historic district of Bangkok with Follow Me Bike Tours. I know it sounds crazy, but it was a lot of fun! Since it was Saturday morning the traffic probably wasn’t as bad as a weekday. We also lucked out and got a private tour again (probably because of the decreased number of tourists in the area due to the recent flooding). We arrived at the clubhouse at 7:45am and met our two guides, Tob and Kathy. Equipped with 24 gears, heavy duty shocks and ultra cushy seats we set off to tackle the jungle of Bangkok. We did have to cross or ride on major streets a few times (thus experiencing cars and motorcycles whizzing by and large buses brushing up right beside us), but most of the trip we were on backstreets, narrow alleys, pathways and sidewalks which was actually a lot of fun. Only someone who was intimately familiar with the area could do this route without any help. We covered 25 km in 4 hours and got to see many historic sites in Bangkok that most tourists never see (or even know about). The only bad thing about a bike tour is that it’s hard to take pictures unless you stop. If you stop too much, you’re not going to get very far. So some things we only got to see the outside of as we passed by. Our route followed north along the east bank of the Chao Phraya River. 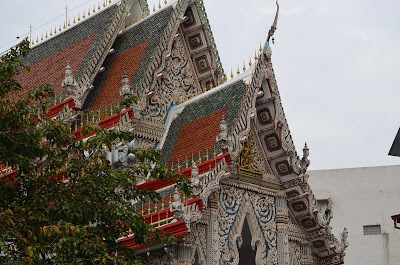 We passed the Shangra-la Hotel and soon stopped at Wat Suwan Plu. This temple had it’s own elementary school and we watched as the kids assembled early that morning. Unlike the other wats we’d see everywhere else, the monk’s quarters were very simple. They were made of wood boards and had pretty carved wood panels. The bot (prayer hall) was white with beautiful carvings, statues, and some light blue tiles highlighted by touches of gold. We continued on our way entering the farang (foreigner’s) quarter of Bangkok. We passed the Assumption Cathedral, the East Asiatic Company, and the French Embassy before stopping at to the Old Customs House. Built in the 1880’s, it was obvious that this was once an incredibly beautiful European style building, but now it’s in a very sad state (it’s great to photograph however). The fire department uses the lot now, and there was still some water in the lot from the recent floods (sandbags were still piled four feet high along the river bank). We were told there were plans to eventually restore the building to it’s original glory. We then biked thru was a small Muslim community and past the Portuguese Chancellery (the Portuguese were the first foreigners to have formal ties with Siam), before stopping at the Holy Rosary Church (built by the Portuguese in 1786). Outside the church was a garden with a little shrine, a Christmas tree, a tree with hanging presents, and a snowman made out of recently used sandbags. The inside was a beautiful old fashioned church with ceiling fans, stained glass windows, and a gorgeous ceiling. Then we biked through Chinatown. Thank goodness we were there before the crowds arrived. Even this early the place was like a beehive and almost impossible to get through at times. We stopped once to get some pictures of the main walking street. We followed Tob down all sorts of narrow corridors, past an old Chinese shrine, and we watched everyone frantically preparing for the busy weekend ahead. We stopped at Wat Chakrawat, which is a small temple with a black and gold facade. 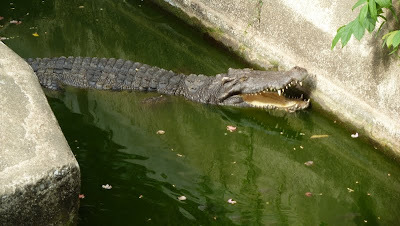 Our guides were anxious to show us the most popular residents here – the crocodiles. We peaked over the wall and sure enough there was one in the pond. Right around the corner was another caged within a fence sleeping. They turned on a hose to wake him up and cool him off with some cold water. In a glass case near the pond, was the skeletal remains (with skin) of the first crocodile they pulled from the river some 50+ years ago. Plenty of dogs and cats hung out in this area too. We learned about the guards in front of the wats. One is male and one female. The male usually has a ball, and the female has a baby. We then made our way back to the river bank and stopped right before we entered Pak Khlong Market – Bangkok’s largest wholesale market. Most restaurants and local markets come to here to get their goods. It’s open 24 hours a day and it’s busiest in the morning. Without stopping, we went through the market which was loaded up with everything you could possibly think of. The array of smells we passed ranged from amazingly divine to very pungent. The volumes of food moving through here made Costco look like child’s play. Trucks were piled high with bananas, cabbage, peppers, onions, garlic, crates of fruit, etc. There were bins and baskets filled with large industrial size bags of produce as well. Carts, trolleys, and dollies were moving goods around. This went on for several city blocks…all sorts of vegetables, fruits, fish, chicken, spices, flowers, and who knows what else. I knew we’d have to come back here at some point to get some photos. We stopped at a ferry dock right across from Wat Arun (Temple of the Dawn). 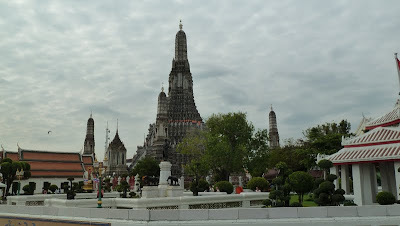 Wat Arun is a stunning structure – even from far away and especially on a cloudy day. We boarded the ferry and headed to the other side. After we docked, we explored the temple grounds. We didn’t go into the Wat since we could easily admire it’s porcelain covered exterior from where we were. We walked to the river bank and saw the official name of Bangkok. Kathy read it out loud to us. It’s in the world record book for the longest name of a place…translating to something like: “the city of angels, the great city, home of the emerald Buddha, built by…etc”. We biked south along a boardwalk paralleling the west bank of the river and stopped at the very old Chinese shrine, Kuan Yin, dedicated to the god of mercy. Looking like it’s been standing there untouched for 200 years, this place could use some mercy (or restoration work). Our next stop was Santa Cruz Catholic Church (built by the Portuguese). Finally we stopped at Wat Prayoon which had it’s own museum. The 180 year old all white chedi was recently restored and all sorts of amulets and buddhas were found inside it’s chambers. This is the only chedi we were able to actually go inside. The courtyard was beautiful lined with old pieces of timber taken from the chedi’s interior during it’s restoration. 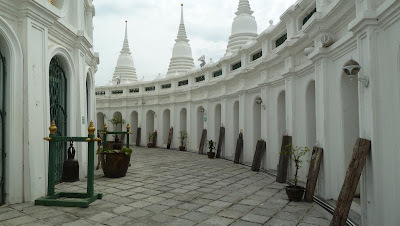 We went into the very center of the chedi admiring the secret room and then climbed up to the top for a great view. We went a little further south and eventually took another ferry back across the river and continued back to the clubhouse. Tob stopped and ordered all of us some street food which we brought back to the house and ate for lunch. 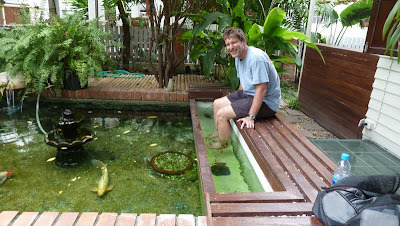 The owners had a spa fish bath on their property which Robert decided to try. As soon as he put his feet in, the fish went after him – nibbling all over. He started laughing saying how much it tickled. I didn’t try it…for some reason I had images of piranhas in my head. We talked for awhile, wrote comments on their wall and then headed back to our hotel to relax.